I thought that the idea is brilliant and I might not agree with recent events but nevertheless the whole thing is pure genius and the creativity involved is one that we come across every so often. I have to give a big Hi5 for the creative team behind the blog and who ever helped to make this possible. 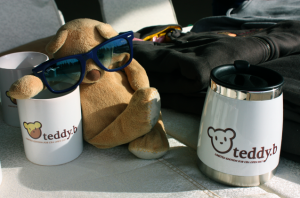 The whole idea is meant to be for a good cause as Teddy B will be auctioned off at the end of the project. The pictures are very well thought of and I hope there will be a book out at the end A big cheer to Teddy B and the people behind him as he is over a third of the way on his journey. I highly recommend that you check out his blog. Whoa I like your blog design it’s super cool! Thank you for your kind words and support! it was a pleasure meeting you and my my I do look good in that photo Yea, the recent posts are a bit wild but it’s all part of the mini series and my naughty side. There’s always good and bad in everybody keep up the work! And hope to meet again soon.